UDM Downloads > Complete Time Tracking Software! Easily track your time using automatic time recording or manual time entry. 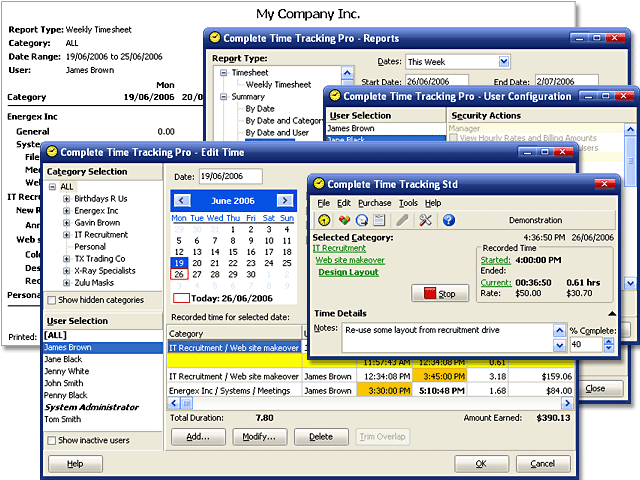 Time can be recorded to user-defined categories and sub-categories such as customers, projects and tasks. Set hourly rates for customer time billing or to watch your income accrue. Generate a variety of summary and detailed reports including information such as a weekly timesheet, and time and income grouped by date or category in several formats. Reports can be generated to screen and printer or exported to file in XML, HTML, Word, Excel, Text and other formats. The time tracking window conveniently hides off the edge of the screen for instant access.